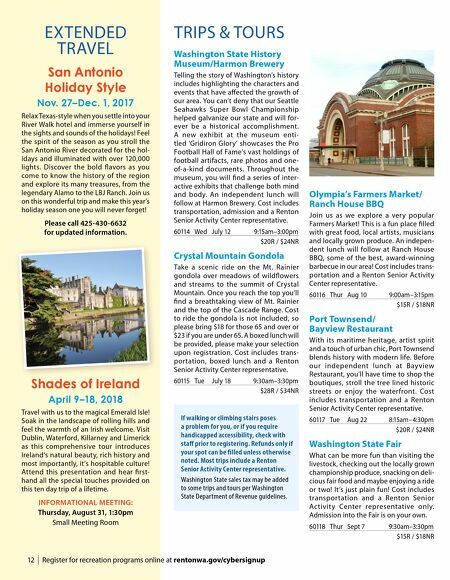 For more information, call the Renton Senior Activity Center at 425-430-6633 | 13 Blood Pressure Retired nurses volunteer their time to keep you healthy by mon- itoring your blood pressure. Closed September 14 and 21. Thursdays 9:30–11:30am NR Clutter Buster Support Group Clutter Busters is a support group for hoarders, clutterers and cre- ative messy people. If you have too much 'stuff,' Clutter Buster meetings will offer a way to help you get in control of your living space. Clutter Busters is not a class, we use a support group format. Using a self-help book study method, you will gain insight and motivation toward over- coming hoarding and disorganization. Members are encouraged to share recent efforts to overcome clutter and hoarding in a safe, confidential, non-judgmental and supportive atmosphere. Facilitated by Keith Collingwood. No meetings on September 15 and 22. Fridays 9:30–11:00am SMTG Foot Care We have foot care service for people who cannot manage their own foot care. Karen's Foot Care Services specializes in gentle foot care for senior citizens. Call the Renton Senior Activity Center foot care line at 425-430-6662 to schedule an appointment. Appointments can be made for Wednesdays. The cost is $27. 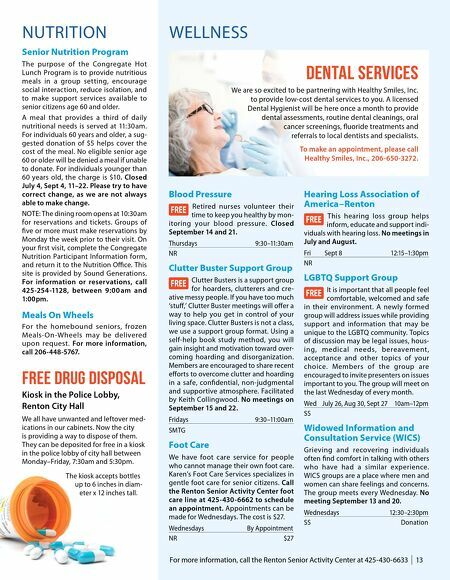 Wednesdays By Appointment NR $27 Hearing Loss Association of America–Renton This hearing loss group helps inform, educate and support indi- viduals with hearing loss. No meetings in July and August. Fri Sept 8 12:15–1:30pm NR LGBTQ Support Group It is important that all people feel comfortable, welcomed and safe in their environment. A newly formed group will address issues while providing support and information that may be unique to the LGBTQ community. Topics of discussion may be legal issues, hous- in g, m e dic al n e e ds , b e reave m e nt , acceptance and other topics of your choice. Members of the group are encouraged to invite presenters on issues important to you. The group will meet on the last Wednesday of every month. Wed July 26, Aug 30, Sept 27 10am–12pm SS Widowed Information and Consultation Service (WICS) Grieving and recovering individuals often find comfort in talking with others who have had a similar experience. WICS groups are a place where men and women can share feelings and concerns. The group meets every Wednesday. No meeting September 13 and 20. Wednesdays 12:30–2:30pm SS Donation WELLNESS NUTRITION Senior Nutrition Program The purpose of the Congregate Hot Lunch Program is to provide nutritious meals in a group setting, encourage social interaction, reduce isolation, and to make support services available to senior citizens age 60 and older. A meal that provides a third of daily nutritional needs is served at 11:30 am. For individuals 60 years and older, a sug- gested donation of $5 helps cover the cost of the meal. No eligible senior age 60 or older will be denied a meal if unable to donate. For individuals younger than 60 years old, the charge is $10. Closed July 4, Sept 4, 11–22. Please try to have correct change, as we are not always able to make change. NOTE: The dining room opens at 10:30 am for reservations and tickets. Groups of five or more must make reservations by Monday the week prior to their visit. On your first visit, complete the Congregate Nutrition Participant Information form, and return it to the Nutrition Office. This site is provided by Sound Generations. For information or reservations, call 425-254 -1128, between 9:00 am and 1:00 pm. Meals On Wheels For the homebound seniors, frozen Meals- On-Wheels may be delivered upon request. For more information, call 206-448-5767. Free Drug Disposal Kiosk in the Police Lobby, Renton City Hall We all have unwanted and leftover med- ications in our cabinets. Now the city is providing a way to dispose of them. They can be deposited for free in a kiosk in the police lobby of city hall between Monday–Friday, 7:30am and 5:30pm. The kiosk accepts bottles up to 6 inches in diam- eter x 12 inches tall. Dental Services We are so excited to be partnering with Healthy Smiles, Inc. to provide low-cost dental services to you. A licensed Dental Hygienist will be here once a month to provide dental assessments, routine dental cleanings, oral cancer screenings, fluoride treatments and referrals to local dentists and specialists. To make an appointment, please call Healthy Smiles, Inc., 206-650-3272.